Located 15 miles north of the Puerto Vallarta International Airport, and about a 30-minute drive from Puerto Vallarta, is the small tucked away gem La Cruz de Huanacaxtle. The town of La Cruz is quietly and comfortably nestled around its precious beach, the lovely Playa La Manzanilla. With its slightly-sloping, crescent-shaped features, one-mile-long Playa La Manzanilla is broad and sports beautiful grey-colored sand which is much darker than that of other area beaches. From the shoreline of Playa La Manzanilla, gentle surf extends outward for about a mile. Along this section of Banderas Bay the ocean waves are calm and the water shallow, making this a perfect place for kids and families to swim and float. 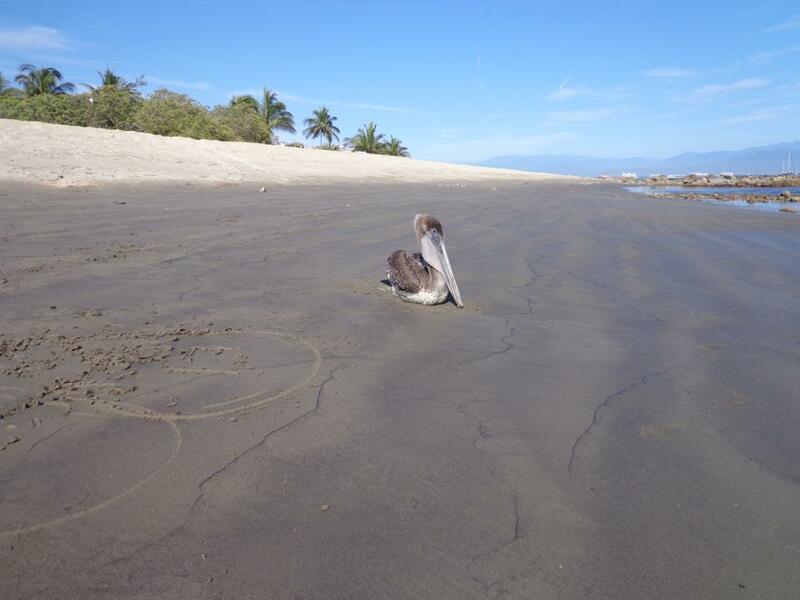 While all beaches in Mexico are public, unfortunately many beaches along the coastline of Banderas Bay are not easily accessible. So one of the wonderful things about Playa La Manzanilla is that it’s easily accessible to the general public. Conveniently, there are palapa eateries right on the beach and several nearby shops selling beach gear and swimsuits. During the low-season months there is not a thick and heavy stream of tourists arriving to the beach. However, during the high-season months there is a definite shift in activity. On weekends and all major holidays the low-key and serene Playa La Manzanilla quickly springs to life, becoming quite packed with tourists as well as locals and their families. The beach scene during these times is often umbrella to umbrella, towel to towel. However, the section of beach at the southern end of La Cruz, fronting a line of newer condo buildings, tends to remain more tranquil. Within Banderas Bay, the ocean water off the little town of La Cruz is absolutely the best area for fishing, with a good number of its residents employed in the fishing business. With a starting point of about $25 per hour (pricing is often negotiable) many of these local fishermen offer fishing excursions for tourists seeking tuna, snapper, sea bass and other fish. In 2008, a beautiful and modern 400-slip marina was constructed. Marina Riviera Nayarit is one of the finest marinas in Mexico, boasting 351 dock spaces for boats ranging in length from 31 to 400 feet. Services around Marina Riviera Nayarit include a daily fish market, dry dock facilities for boats, yacht club, restaurant and sky bar, and a spa. Parking is readily available throughout the town, marina and beach areas.